Think about NFC, probably, you imagine payment systems, door lock access controls, tags, IoT or many other devices. Interestingly, the NFC readers play the most important role in this technological environment. Some readers have different capabilities depending in its configuration, or how they were programmed. The main function of a NFC reader, is exactly that, to read. But until now, I did not find an example about how those devices can detect and read more than one NFC card simultaneously. There is a NFC myth about reading two cards at the same time: could be inappropriate, difficult or impossible because this process depends on many different factors: induction, detuning, power draining or insufficient power and many other things. I have been researching NFC for around one year, and until now, I could not see an example which challenges this myth. As usual, to be capable to do something like this, we should consider to learn as much as we can about the NFC reader that we will implement, and how it processes the cards, data and power under the hood. I will use the PN532 board from Elechouse and its datasheet from NXP. I will implement the SPI configuration to read data connected with an Arduino. Adding that I will use this datasheet as reference throughout this post. I implemented the core of Adafruit library. I created new methods implementing the original code as reference. Analyzing the datasheet I noticed that in the section of InListPassiveTarget states that this device has support to initialize 2 targets as maximum at once. Cool! It is enough for a PoC. I did not start from scratch. I used the iso14443a_uid example from the Adafruit library. Why this is important? Lately, many people is adapting 2FA(Two Factor Authentication) in the software side. But… What about if we start using 2FA in the hardware side as well. Two keys for physical authorization: one could be a physical card and a second could be a phone; just to mention an example. To access a building, start a car, or share an access privilege between two individuals. Knowing that NFC is an exploitable technology, like any other. We should create and design new methods and methodologies to improve it. Some of them could be readers with constant internet access to validate authorized users, share keys securely or update a card every time someone used it. What about if we implement developed protocols to give them a second use. For example the NFC payment systems, we could implement them as well to authorized users using the tokenization protocol. Well, there are many ways to work with NFC, and I will continue researching about it! Stay tuned! 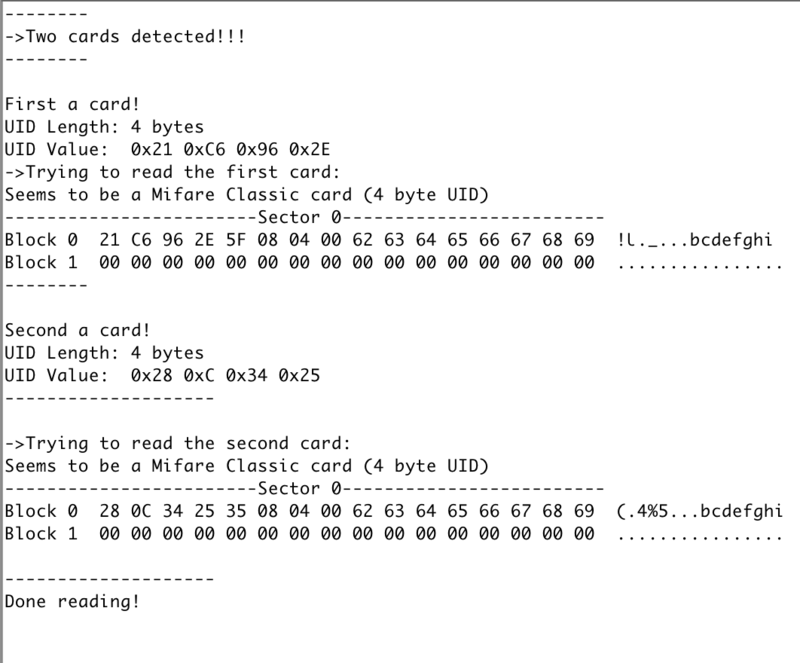 Hey there Salvador, I’ve been working on getting this to work and am very close I’ve gotten the two cards detected but am having trouble authenticating and reading the data blocks. It seems the github link above is 404. Any chance you still have that or could help me out with what you changed in the Authenticate and ReadData functions? Not sure what happened with that link, but I made a copy of these two functions: mifareclassic_AuthenticateBlock and mifareclassic_ReadDataBlock and I added a new parameter: tagActive to the both new functions. Do this for both copied Auth2 and Read2 functions.